At H@ME & EAT, we host a wide range of events. From our Acoustic Evenings to Comedy Nights, there surely is something for everyone. We have a fully licensed bar and offer food at our events, ensuring you are fully catered for. To browse upcoming events use the calendar which will also provide further information of your desired event. Unless stated in the event page description, no physical ticket is required to enter our events. Also, seating is on a first come first serve basis and of limited numbers so we recommend arriving at the time the doors open. Refunds for events can be issued up to a week before the event date. After this point, a 50% refund can be issued. No refunds are available on the day of the event unless the event itself is cancelled under extreme circumstances. The issue of a refund is subject to Terms & Conditions. All events are 18+ unless stated otherwise. Thank you for your understanding. Are you looking to book a time slotted event such as our Sunday Roast or Afternoon Tea? Click the button below to book your appointment now. Are you looking to host a celebration, corporate or festive event? Look no further than H@ME & EAT, one of Hertfordshire’s most unique locations. With the facilities to serve food, as well as a full alcohol and music licence, we have everything that you’d need to host your event. For more information regarding venue hire, please fill out the form below or call 01279 814 644 and we will get back to you as soon as possible. The H@ME & EAT restaurant is known for it’s famous cooked breakfasts as well as much more to enjoy from our menu. From our daily specials, including Fish & Chips, Steak & Ale Pie and much more, to our fresh Salads, Pizza’s and H@MEMADE Burgers, we surely can guarantee you will find something to satisfy your appetite. We also serve our H@MEMADE cakes and scones with fresh leaf tea or coffee until 17:00 each day. View our full menu below, hot food served until 15:00 daily. Come and enjoy our traditional Sunday Roast, served with all the trimmings. For only £11.99, with kids portions and a choice of meat available, we truly believe this is on par with our famous cooked breakfast. 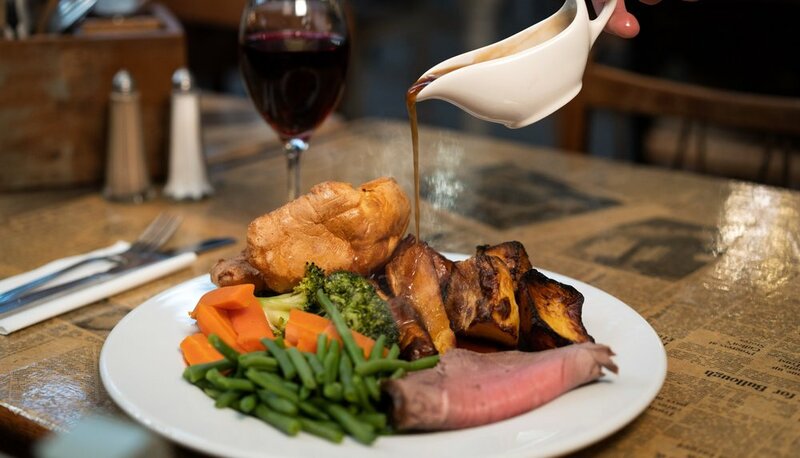 Book now to avoid disappointment, Served between 12:00 - 15:00 every Sunday. If you are considering the idea of a luxurious home spa at an affordable price, the Wellis range of hot tubs and spas are well worth taking a closer look at. These products offer a fantastic selection of water jets and therapy features, as well as a great choice of colour options. The Elbrus Deluxe won WhatSpas? 2016 award for the best spa product in its price range. Founded in Hungary in 2003, the Wellis brand has maintained steady growth and is now the largest spa manufacturer in Europe. Around 20,000 families currently enjoy the benefits of Wellis products at home. To view the full range and find out more, visit the Spa Wars website below. Located in Bishop’s Stortford, H@ME & EAT is a one of a kind environment, hosting a Restaurant, Shop and Hot Tub Showroom. H@ME & EAT is a restaurant and homeware store located on the outskirts of Bishop's Stortford in Hertfordshire. In store you will find a broad range of items for your home, from Yankee Candles to handcrafted furnishings. H@ME & EAT is also home to Spa Wars, a company specialising in Hot Tubs and Spas. Be sure to explore the in-store showroom to find the perfect Hot Tub or Spa for you. In the Restaurant section of the store, you will find a wide range of freshly cooked cuisine, prepared daily for your indulgence. Ranging from our highly popular cooked breakfasts, to our H@MEMADE burgers, you will find the right meal for you, no matter what time of the day it may be. H@me & Eat is packed with amazing pieces. Our style is always evolving, Following new trends and materials. We offer our customers an eclectic, unique style which is both quirky and interesting ...we simply love what we do and really hope you enjoy shopping with us! Unit 3 Birchanger Ind. Est.